Abstract: Using chemical vapor deposition, we grew carbon nanotubes (CNTs) on the surface of Si nanoparticles (NPs) that were coated with a thin iron shell. We studied the CNT growth mechanisms and analyzed the influence of (1) varying annealing times and (2) varying growth times. We show that an initial annealing is necessary to reduce the iron oxide shell and to start the formation of Fe NPs and their consequent coarsening. We characterize the evolution of the catalyst morphology and its influence of the morphology and structure of the CNTs grown. 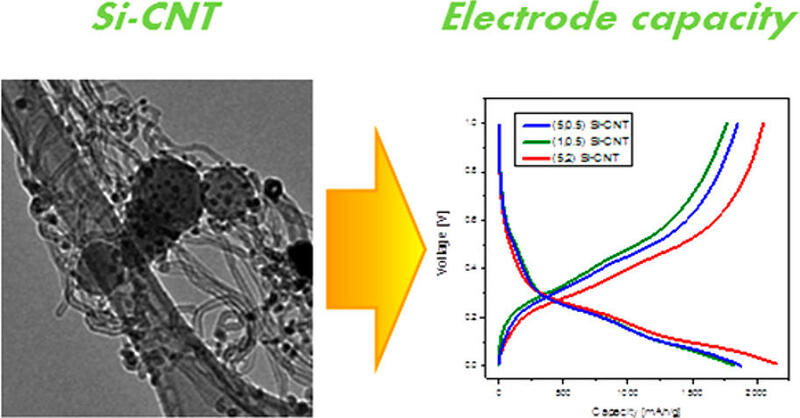 We studied this nanocomposite of Si NPs interconnected by CNTs grown on them as anode material for Li-ion batteries. Compared to the pristine Si NPs, the Si-CNT nanocomposite brings an increase of 40% in specific capacity after 100 cycles at 1800 mA/gSi with a high stability and a very low capacity loss per cycle of 0.06%. The electrochemical performance demonstrates how efficient the CNT shell on the Si NP is to mitigate the usual failure mechanism of Si NPs. Thus, the in situ growth of CNTs on Si anode materials can be an efficient route toward the synthesis of more stable Si anode composites for a Li-ion battery.